Some of the greatest wines in the world are produced in Piemonte. The Langhe could be considered the heart of the Piemontese wine industry. We are not just talking about Nebbiolo, Barolo, Barbaresco and Barbera. We are also talking about Roero Arneis. Historically the local cuisine is elaborate and complex. The Langhe was the favorite vacation destinations for the Kings in Turin. This brought the best chefs and winemakers to this small area in Piemonte. Numerous small castles and monasteries are found in this area. They are smaller than the palaces in Turin or Alessandria but are still castles with 3 foot wide walls fabricated with hand cut and fitted stone. Monasteries are very similar to castles. They may have been filled with monks but they are formidable fortresses with limited access routes, internal water and food sources and dominating tactical positions making them easy to defend. These characteristics also give them marvelous views and a wonderful ambiance. These hidden gems are a unique opportunity for a once in a lifetime experience of culture, food and wine. A recent article showcased a neat agriturismo in Alba. The Relais San Maurizio Hotel of the Monastery S. Stefano Belbo is the opposite end of the vacation experience. The XV century monastery was recently restructured. The renovation maintained the original structure and façade. The cellars cleaned but left amazingly authentic. Every little corner of this hotel holds something interesting from the river stone walls to the arched brick ceiling of the wine tasting room. Ceilings are hand painted murals with support beams intricately carved images and decorated in gold leaf. The services are also at the top end of luxury. The hotel offers complete spa facilities as well as conference rooms and high-speed Internet access. The restaurant prepares regional dishes with gnocchi, tartufo, stewed meats, wild game, elaborate sauces and wonderful cheeses. The wines of Piemonte are all available to compliment these marvelous culinary creations. Gaja, Giacosa, Ceretto, Produttori del Barbaresco, Giuseppe Cortesi and many others are always available. We have a few Zucchini plants in the garden. Zucchini and other squash are quite powerful plants. The rule is, “A few plants, lots of squash.” There is a way to keep the production in a relatively normal zone. When the male flowers blossom, eliminate about half of them. Yesterday we spent some time doing just that. Zucchini flowers are considered a delicacy in Italy. They are deep fried, stuffed, placed on pizza, or used as an ingredient in risotto. The flowers are highly desired but difficult to find because the flower begins to wilt as soon as it is picked thus cannot withstand normal channels of retail distribution. Allowing the flowers to simply wilt on the ground would have been a sin. Raffaella pulled the recipe for a risotto from her hat of tricks and the flowers made their way into the kitchen. One of our normal cooking buddies, a truly great chef with a flair for French and Cajun recipes, offered to prepare grilled Halibut. He had never tried the Zucchini flowers but once he understood the nature of the dish, he decided that the fish should be as delicate as the risotto. The Halibut was prepared with salt, pepper, olive oil and lemon slices finished off with fresh chopped Italian Parsley. It was the perfect mix. Our choice for wine was a light Pinot Grigio. Other great solutions would be Vernaccia, Soave, Gavi, Gaia & Rey, and Tocai Friulano. Bring the broth to a boil and turn the heat to minimum. The flowers must be fresh. Delicately open the flowers and remove the pistols with a pair of scissors. Rinse the flower under cold water and let them drain on paper towels. Set the flowers aside. Melt 4 tbsp butter in a heavy pot over medium high heat. Add the diced onion to the pot and sweat the onions until transparent. Add the rice. Stir the rice into the butter and onions coating the rice for about 1 minute. Separate the petals of the flowers delicately. Add the flowers and stir them together with the rice. Pour the wine into the rice and stir quickly for 1 minute. Add 1 ladle of broth. When the broth begins to boil check the timer. It will now take 22 minutes to cook the rice. As the broth evaporates add another ladle of broth. Stir constantly the rice. Continue until the 17 minutes has passed. Put the saffron and cook everything for an additional 5 minutes. Turn off the heat. Stir in the remaining 1 tbsp of butter and the Parmesan cheese. Let rice sit for 1 minute (mantecare). Serve hot in individual plates. March 8th is International Women’s Day, or Festa della Donna. I have written about the sad events that lead to International Women’s Day. 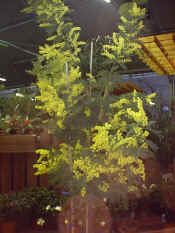 In Italy most men will present their female acquaintances and colleagues with a branch of yellow flowers from called Mimosa. So here, with best wishes, is my electronic Mimosa! Triumph is a widely known line of lingerie and bathing suites. Their products are generally considered of higher quality with many handmade models. Pricing is well within the grasps of the middle class however some specialty items can be quite expensive. I found this line in the early 90s. They happen to have their headquarters in Trescore Balneario near my home in the Valle del Bergamasco. I came to appreciate their product line after doing some computer networking jobs in the production facility. I was able to observe their processes and quality controls first hand. They truly produce a quality product. Without further comment, here is the selection for the 2008 Beach Fashion. Recently I presented the collection of La Perla. This is definitely one of my favorite times of the year. I write these articles for my female readers but I am not sure whether the men or the women appreciate them more. Calzedonia is a top line producer of women’s stockings and lingerie. Their price point is about 30% less expensive than the La Perla line and can be purchased both in stores and online. Without further comment I will let you decide if they are interesting or not. Please comment if you find something you like. Every year I have the opportunity to present a couple of beachwear designers. La Perla is known for its exclusive lingerie but the bathing suites and throws are none less titillating. Last year was all about bright colors. The 2008 line is soft fabrics with exotic prints. The natural tone colors almost disappear against a well tanned body. Most top and bottom sets combine complimentary colors. Subdued natural tones intertwine with bright natural coral and sea colors. In line with the 60s look these suites do not offer support. They adorn more than shape. They are also somewhat skimpy and will not leave much to the imagination. The exceptions have veil like bands that can be tied down the middle or cross-tied. The solid color versions are finished with gold and silver metal borders. They are a more traditional look for the less eclectic. The outfits are a combination of “The Jetson’s” loosely combined with the Woodstock era. The shoulders seem to have wings and a tight waist evidencing the hourglass figure. The Woodstock influence brings in flowing ankle length skirts in cotton and silk. Tie die patterns are prominent. I am not sure how the Peacock tail ended up in some of the patterns. Perhaps experimental new drugs designed for the 23rd century. The final group of designs would have been fit for a young Mortisha Adams. I am not sure how they fit into the traditional Fendi but are somehow intriguing. A study by Maria Cerutti of the University of Verona caught my attention. Without a doubt I have a weak spot for spikes. Interestingly this study has been picked up by numerous worldwide news agencies in conjunction with a series on the lack of passion in couples married more than five years. I guess the news agencies see spikes like I do. They are great for the mental part of any relationship. Apparently high heels not only lengthen the natural lines and curves of the female figure but also provide significant physical benefits for the couples sexual pleasure. Ms. Cerutti takes psychological preferences to a scientific level. The study included 66 women under 50. The electrical production of various muscles was measured while walking with various types of shoes and different heights of heels. Heels, 3 inches and higher, produced a 15% increase in muscle strength. Many women practice muscular contractions of the pelvic muscles. Wearing a pair of high heels could produce much better and uniform results. I find it interesting that Ms. Cerutti found a way to prove what I already knew in my subconscious. Women who wear high heels are better lovers. Viva Le Donne!